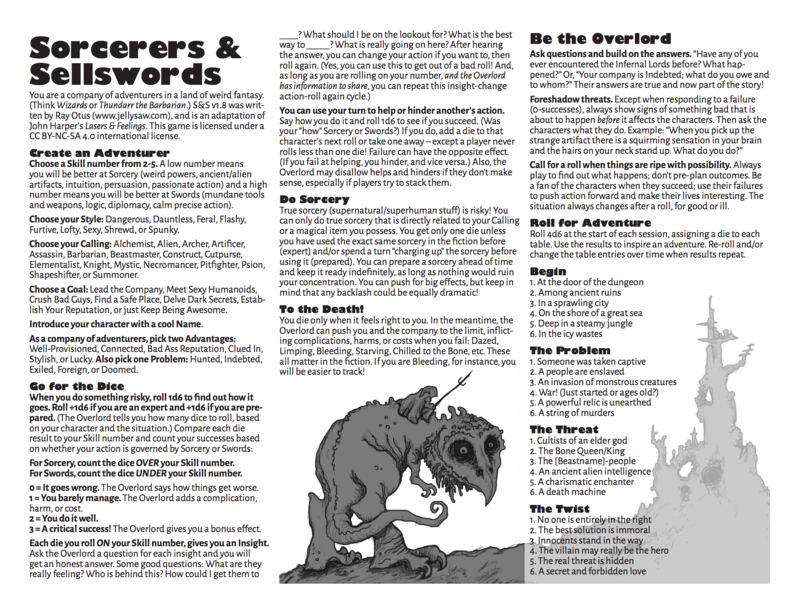 Sorcerers & Sellswords is a one-page game derived from John Harper’s Lasers & Feelings. The game’s flavor is weird fantasy - think Clark Ashton Smith, Ralph Bakshi’s Wizards, the early tales of Fritz Leiber’s Fafhrd & the Gray Mouser, Thundarr the Barbarian, etc. The world is full of dangers and mystery. A person’s safety and livelihood often depends on their wits or a strong arm. Sorcerous powers are available to those desperate or insane enough to use them. Both S&SS and L&F are fantastic for pick-up games and one-shots. They can sustain short campaigns or even longer play for people who want episodic adventure and aren’t as concerned with things like consistency/simulation or leveling up. The play style is very much in the Powered-by-the-Apocalypse tradition (experience with Apocalypse World, Dungeon World, or another PbtA game helps), though the dice mechanic is different. With this edition, I've stretched the "one-page" definition a bit. 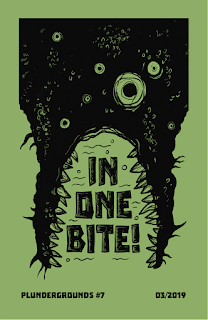 You only need the first page to play, but I have included a "lexicon" that can be printed on the back of the rules, as well as a page of blank character sheets. So it’s a one-page game, but the file has three pages. The PocketMod includes a character sheet but no lexicon.